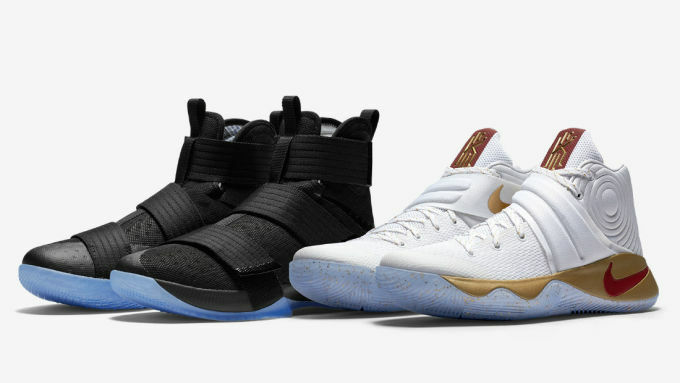 Strongly hinted at earlier today, Nike Basketball will be releasing sneaker packs celebrating LeBron James, Kyrie Irving and the Cleveland Cavaliers&apos; triumph in last season&apos;s NBA Finals. The first "Four Wins Pack" takes us back to Game 3, when the home crowd lifted Cleveland to its first win of the series. In the game, James wore the blackout Nike LeBron Soldier 10, while Irving went with his white, wine and gold Kyrie 2. Both shoes are now being packaged together in a dual-branded box as a tribute to the series-shifting game. Nike will be selling the Game 3 pack in limited quantities exclusively via the House of Hoops truck in Cleveland and at select Nike, Foot Locker and boutique shops this Saturday, Oct. 22.